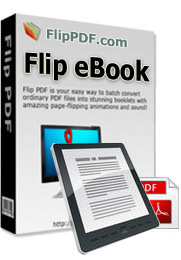 Flip eBook is a professional flip book maker to allow you to automatically change eBook (*.pdf;*.epub;*.mobi;*.lit;*.rtf;*.fb2;*.rb;*.lrf;*.pdb;*.pmlz;*.snb) into interactive digital editons with simple navigation and advanced look. View the eBook as flipbook on your iPod, iPhone, Android and more. Full Look & feel customization of your eBooks. Prepare great presentations on data carriers (cd/dvd/usb). Flip eBook is a powerful flip book maker that turns your ebook (PDFs, Amazon Kindle, EPUB, Mobipocket, Microsoft Reader, etc...) into interactive sales tools that look and read like a real paper catalog or magazine. With Flip eBook, you can create compelling and beautiful digital eBook in no time. Flip eBook's digital publications have been created for any business, which has eBook files (PDFs, Amazon Kindle, EPUB, Mobipocket, Microsoft Reader, etc...) on its websites and wishes to publish them in a more available and attractive way. Flip eBook is an excellent solution for online bookstores, publishers, companies publishing advertising materials and for everybody who publicizes products online. - Turn page experience - grab a page-corner, flip the page. With our easy to use interface, you can make a digital publication in a few mouse clicks! 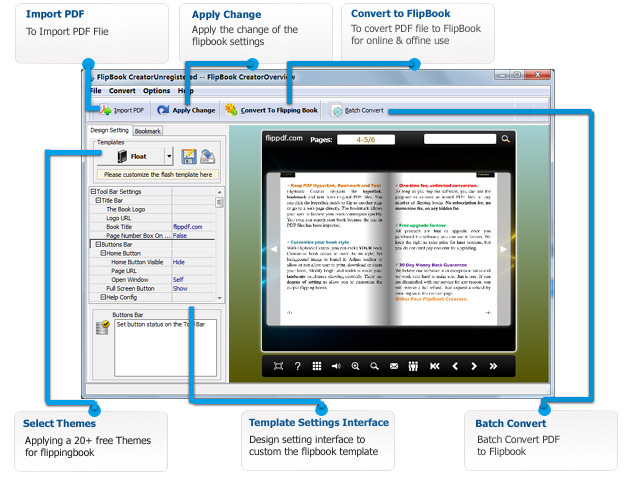 Even a new user, you can use Flip eBook within a couple of minutes without any special learning. Beside Flash version, all publications created by Flip eBook will also include HTML5 version. The readers will be able to open your flip page publication in any environment (PC, Mac, iPhone, iPad, Android, or Windows Mobile), and you can even publish at your Facebook page. Flip eBook supports analyzing and importing table of contents from PDF files. After that, you can edit the imported table of contents. If you want to create it by yourself, instead of importing from PDF, or your PDF does not contain a table of contents, Flip PDF can help you to create table of contents for your digital publication. If you have a Google Analytics account, you can make use of Flip eBook’s built-in functionality Google Analytics Embedding. The code of Google Analytics can be embedded to each book and all statistics will be available from your Google Analytics account live. Create, design, control and increase your marketing effectiveness using Google Analytics within the publications. Once you have purchased the software, you can use the program to convert an unlimited number of eBook files to any number of page-flipping eBooks. No subscription fee, no conversion fee, not limited to a single website.